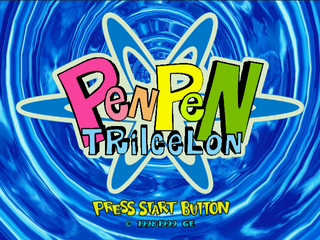 Pen Pen TriIceLon (ペンペン トライアイスロン), known simply as PenPen in Europe, is a Sega Dreamcast racing game by General Entertainment. It was one of the first Dreamcast games to be announced, along with General Entertainment's other game Godzilla Generations and was a launch title for the system in Japan, North America and Europe. PenPen TriIceLon is a 1-4 Player triathlon game consisting of running, belly-sliding and swimming. Each player controls a penguin-hybrid (PenShark, PenOctopus, PenSeal) and races in one of 4 worlds: Sweets, Jungle, Toys and Horror. There are 5 races in each world: Easy, Medium, Hard, VS. Same and VS. Hanamizu, where you have to race against a cheater. In every race except Easy, there is also an obstacle somewhere in the walking area. A list of the characters and worlds (including where the obstacles are) is below. The player controls one of eight characters through a series of races. There are also many unlockable costumes. Happy-go-lucky, though childish, PenPen that absolutely loves speed. He loves giving his best shot at racing. Scary PenShark that is very wild. He is rough when he's angry. Cutsy PenPen that is very selfish. She loves to make herself look as cute as possible. Very laid-back PenSeal, and loves to take things nice and easy. Though rare, when he gets angry he can frighten people. Very comedic PenOctopus. He's probably the Bill Cosby of the PenPen world. Sometimes his mischievous plots backfire on himself. Reckless PenDog, often leaping without looking. He always jumps headfirst into things with no though of his safety. The only PenHippo on the planet that is able to speak. She loves to interrupt other people's conversations, acting on jealousy. ... Let's just leave it as the mysterious PenPen we don't know anything about, OK? This world is owned by Mrs. Cream, and is mainly composed of snow, ice, and edible food. The obstacle in this course is when the PenPens walk into the room with the windmills, and they start spinning and blowing the racers all over the room, preventing them from reaching the other end. This world is owned by Unga Pogo, and he just loves outdoor stuff. The obstacle in the jungle is a spinning roulette found in the middle of the IceBat Cave. It spins for a long time, then pauses for a brief amount of time, then spins again. This colorful animated world is a large toy box owned by Bambi Mask. The obstacle here is where the large open space in the second half of the walking segment becomes a lake, and you either trudge through the lake or bounce off the rubber duckies to get to the next part. This spooky dark world is owned by Horror Man, at age 4771, and loves to scare people. The obstacle is found when you cross two small pools of green water (Yuk! ), and spooky hands pop out and attack you. When hit, you stay down for a while before you get back up. PenPen TriIceLon was given a C+ by Game Revolution. However, the game was criticized for it being short. Main article: Pen Pen TriIceLon/Magazine articles.